Are you looking for part-time work and have food safety experience? Luttrell Staffing Group in Salinas, CA is currently hiring a Receptionist for one of their clients. If interested, apply today! 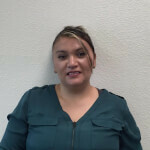 Alma joined the Luttrell Staffing Group-Salinas team in 2014. Before that, she worked at MDT Personnel as a staffing coordinator for two years.